I would very much like to start this article (as I did the last one) by thanking all the readers worldwide who took the time to comment on my previous YouTube articles here on KenStone.Net, as well as sending me all the requests for an article update with some new Compressor presets. 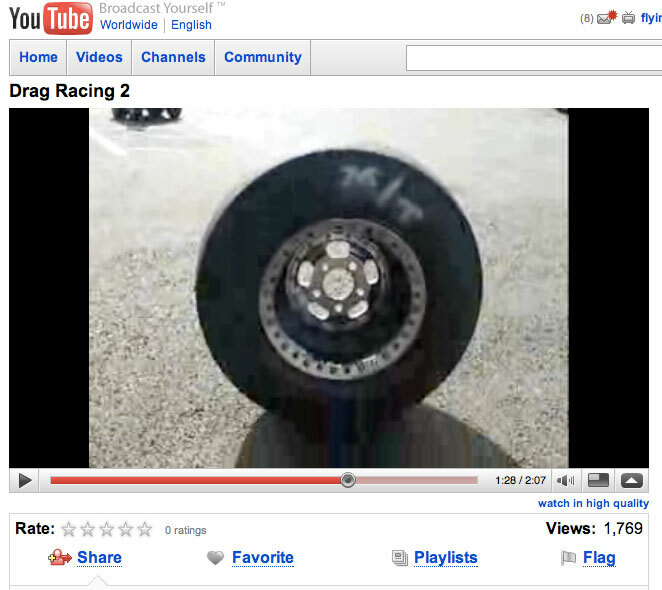 Well here it is folks, High Definition video on YouTube...well sort of...OK, close enough. As was released in the YouTube Blog the site has gone wide screen (16x9) to more closely fit the abundance of HD frame sized video that is out there now. You can get HD cameras from both Sony and Canon for under $1000 that shoot really nice HDV or AVCHD video: all of which are widescreen. You can see a couple of things right off the bat: 1. The video frame is no longer a square but now a nice widescreen rectangle; 2. There's a "watch in HD" hyperlink to the lower right of the video; and 3. A pop-up window (also in the lower right) that displays a message. Before I go any further I should probably give the on screen talent her due: Marina Orlova runs a site called www.hotforwords.com where she creates these short videos on YouTube that look at the etymology of words (I'm not kidding) or uncovers the origins of euphemisms etc. Now, I chose her for this article, for two reasons: 1. because she has had more than 100,000,000 (that's right one-hundred-million) views of her movies; and 2. is one of the more successful producers in the YouTube Partnership Program. So if you want to start getting paid for your content (over six figures) you might want to start watching those who've created working financial models...seriously. Same window size, but just by viewing these screen grabs you can see a noticeable increase in picture quality over the "normal quality" version above. Now before I go into the steps required to encode movies for YouTube HD, there is another flavor of video that you may see on YouTube: "high quality." You'll see that hyperlink under source video that has a better quality version to watch but not one that meets the new HD specification. You'll see this a lot with older videos and new videos that were uploaded with an SD frame size (more on that below). Start with the best-looking video you can. That's pretty much rule number one, the prime directive of all video encoding. Realize that no matter what you upload to YouTube, the initial display of your video will be in "normal quality." The viewer will have to click on the "watch in HD" or "watch in Higher Quality" buttons to view a better quality movie. The magic frame size for your upload video must be 1280 x 720 or higher if you want the "watch in HD" link to appear. Any source that you upload that is a smaller frame size will only have the "watch in high quality" link. The final display size on YouTube will be 640 x 360, but you've got to upload a larger framed movie in order to see "HD" in that display frame. Pass your frame rate right through the encoding process. Meaning if you edited your movie in 23.98, then just pass that frame rate right along to the encoded video. Use a bit rate over 2000Kbps for your encoded video. Keep your overall upload file size under 1 gigabyte and your movie duration under ten minutes. And that's pretty much it. But just like I said in my previous articles, YouTube can be fickle sometimes and the above steps may not work, meaning you only get the "higher" not "HD" quality option. Also, as before, you can add the "&fmt=18" or "&fmt=22" phrases to the URL to try and force the HD version out of hiding. I've also found that deleting the movie and just re-uploading it can make the "HD" quality link miraculously appear. Again...YouTube is free, so it's hard to complain. If you want to learn how to create those pop-up messages (YouTube calls them "annotations") watch this help video. The dude's voice is pretty over the top (sorry brother), but suffer through, it's worth the watch. 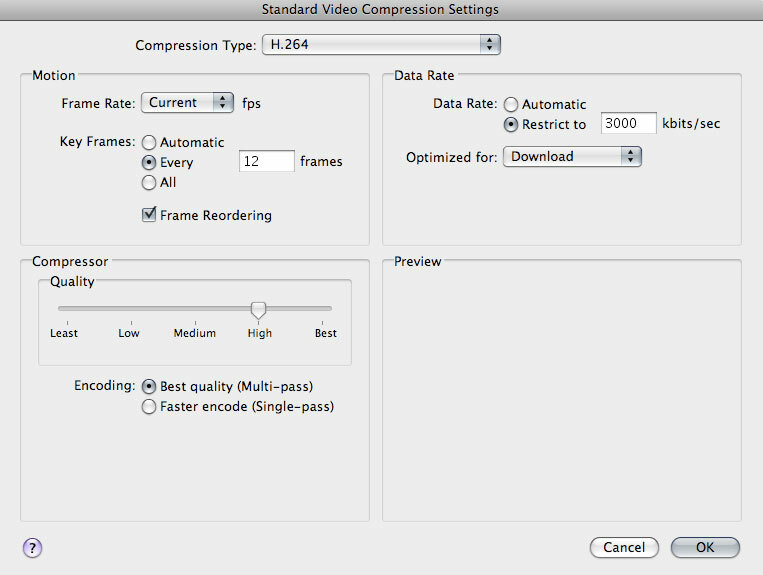 I've created two Compressor presets that you can download and use for encoding HD video for YouTube. One uses H.264 at 3000 Kbps and the other creates a 10Mbps program stream using MPEG-2. Both settings employ Frame Controls, producing a movie that's 1280 x 720 in frame size. Once you have downloaded the presets drag them from the Finder (DeskTop) onto the Custom Folder of Compressor's Settings window. Make sure that you have Compressor 3.0.4 or higher installed. You can increase the Data Rate and lower the Key Frames rate to increase quality and you can conversely lower the Data Rate and increase the Key Frames to reduce overall output file size. Once you upload a movie to YouTube it can sometimes take over an hour for the "HD" or "higher" quality options to appear, so be patient. The MPEG-2 program stream setting should be reserved for challenging media, meaning if you just can't get good results out of the H.264 encodes then try the MPEG-2. This will create a source movie with lots of data, but the file sizes will be significantly higher--you may even chew through the 1 gig limit with a movie that's close to ten minutes. But as I've always said, each source movie is different so it's good to have options. Speaking of options, I'd like to mention a cool product for Compressor that I've come across recently: CRAM Compressor. This crew has created over 300 presets for Compressor that you can use with a basic install of Final Cut Studio 2, meaning you don't need any third-party plugins. Think of the CRAM pack as the Apple presets on steroids. They've got a demo on their site...check it out. Hope this update helps you all with the ever changing world of YouTube, and as always: may your movie files be small, but your quality HUGE. Because this Compressor Preset is licensed free of charge there is NO WARRANTY for the Preset, to the extent permitted by applicable law. Except when otherwise stated in writing the copyright holders and/or other parties provide this Compressor Preset "AS IS" without warranty of any kind, either expressed or implied, including, but not limited to, the implied warranties of merchantability and fitness for a particular purpose. The entire risk as to the quality and performance of this Preset is with YOU. Should the Preset prove defective, you assume the cost of all necessary servicing repair or correction. Award-winning director, writer, and producer, Brian Gary heads Flying Chaucer Films LLC in Los Angeles. Under that shingle, Gary has directed commercials for clients such as Verizon, Lucky Brand Jeans and Dow Jones./Reuters; independent feature films; television; and new media content. As a film producer, Gary's involvement includes independent fare like LOCAL COLOR and major release features like CLANDESTINE (the prequel to L.A. CONFIDENTIAL). He also actively produces content for television, video and the Internet. Rounding out Gary's multi-hyphenate approach to filmmaking is accomplished editor, where he has cut independent feature films, cable television shows for networks such as ESPN, commercial, industrial and new media/ interactive content. Also, in that vein, Brian Gary is a published author with the Apple Certified texts on Compressor and QuickTime and he is the author of Ripple Training's Compressor 3: Up and Running.